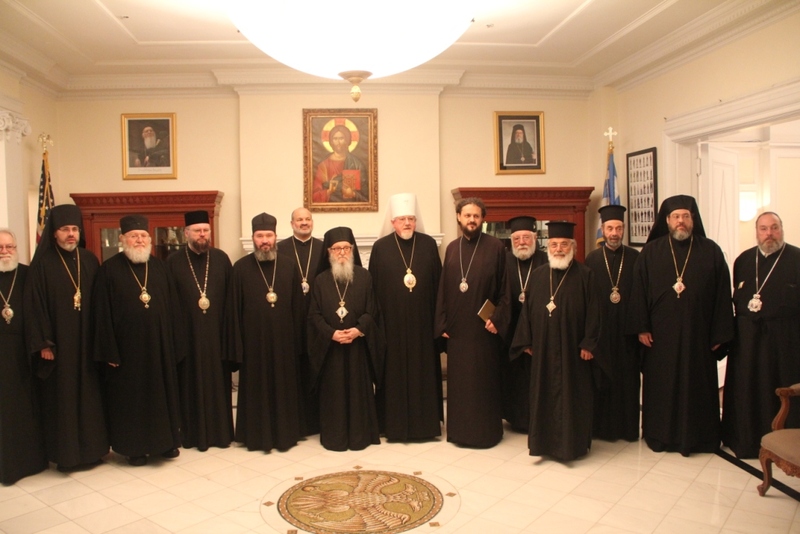 June 10, 2014 – A historic face-to-face meeting of the Assembly’s committee chairmen was organized by the Secretariat’s Coordinator for Committees, Bishop Maxim (Serbian Orthodox Church of North America), and was held on June 10 at the Archdiosecan Center of the Greek Orthodox Archdiocese of America, and was hosted by Archbishop Demetrios. Since much of the work of the Assembly of Bishops falls within the purview of its thirteen committees, the success of these committees is essential for the success of the Assembly as a whole. Ten bishops were present at this meeting, including the Assembly Chairman, Archbishop Demetrios, Metropolitan Antony (Ukrainian Orthodox Church of the USA), Archbishop Justianian, Archbishop Nicolae, Metropolitan Joseph, Metropolitan Evangelos, Metropolitan Savas, Metropolitan Hilarion, Bishop Demetrios, Bishop Daniel (UOC of the USA), Bishop Gregory, Bishop Maxim, Bishop Ilia and Bishop Sevastianos. Also in attendance were liaisons from the Secretariat to the committees: Archimadrite Nataniel, Protodeacon Peter Danilchick, and Attorney Eric Namee. Opening remarks were offered by Archbishop Demetrios. His Eminence thanked all present for the diligent work of the Committees and the Secretariat. He mentioned the significant differences between the Assembly of Bishops and SCOBA, especially the involvement of all the bishops in the Assembly’s work. The critical and important fact of the work of the committees is that all bishops are working together, assisted by the clergy and lay consultants, with cooperation being number one on the agenda. His Eminence encouraged all to start in a pragmatic way, examining admittedly thorny and difficult issues, but being productive and taking a proper perspective on the future. The major task of the day was the review of reports for each of the committees. Most of the committees have met in person and/or via teleconference among the hierarchical members and with their consultants. Considerable progress has been made on many fronts, ranging from development of a sound financial base for the Assembly’s work, through the creation of a canonical registry of all parishes and clergy, the documenting of clergy issues and pastoral practices, the initiation of canonical regional planning, to the examination of different approaches to youth work and monastic communities. Particular emphasis was placed by His Eminence Archbishop Demetrios, upon the importance of this foundational work that will be absolutely necessary to develop a plan for the canonical organization of the Orthodox Church in this country, as the worldwide Orthodox Church prepares for the 2016 Great Council of the Church. Plans for the upcoming Assembly V to be held in Dallas, TX in September 2014 were discussed. The work of the committees, together with their proposed action items and associated issues, will be presented to the Assembly at that time. Detailed progress reports from the various committees can be found in their individual website pages under the tab – committees. This entry was posted in Featured News, News and tagged Canonical Orthodox Bishops, New York City, NY, Orthodox Bishops, United States by OCP. Bookmark the permalink.